Hungarian Redwork Runner – End Finished! 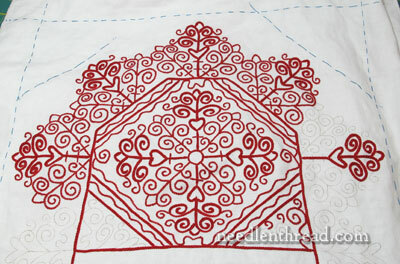 Just popping in this morning with a brief project update – I finished one end of the Hungarian Redwork Runner! Yep, the project creepeth along, but a little creeping here, and little creeping there, and eventually, the embroidery on this thing will be finished! Here’s one completed end! I’m so glad this only has two ends! This is where we were the last time, so you can see that the outside element on the right is now finished, and the inside triangles that flatten out the lower edge there are also filled. Pretty good progress, for working (literally) in 15 minute bouts of stitching. My threads are holding out, but I suspect I will need one more skein of coton a broder 25 in the red. I ordered five skeins and thought I was being generous! So far, I’ve used about two and a quarter skeins. I was hoping I’d make it to the halfway mark with only 2.5 skeins down, but no such luck. I’ve used surprisingly less perle cotton #8 than I thought, though. I just emptied the first ball. At this point, I’d say a fair estimate of thread for the project includes 6 skeins of coton a broder 25 and three balls of perle cotton #8. Now, to creep towards the half-way point! How are your projects going so far in 2013? Any finishes yet? Wherever you are, whatever you’re working on, I hope it’s bringing you much pleasure and satisfaction! If you want to follow the Hungarian Redwork Runner project from start to finish, you can find all the articles related to it arranged in a chronological list under the Hungarian Redwork Runner project index. There, you’ll find the free pattern for this project, as well as information on the materials and stitches used. G’day Mary, looking’ gooder and gooderer’. Really encouraging. I love it. Of course I love the red…looking forward to seeing the rest. Nice job. I’ve completed a crib quilt top and one of 2 quilt blocks. (weird because I’m not much of a quilter) That table runner is an endurance test! Same stitches same colors. You’ve got more endurance in your little finger than I have in my whole body! It’s gorgeous! This is looking good although it’s seems as though your creeping along you’ve done a lot considering the size of the project. Like you my current project The Guardian Angel is creeping along I thought I would be half way by now but alas only a quarter of a way you don’t realise how long these projects take but it is keeping me busy at this snowy time here in North London. I hope you are enjoying your holiday in MS. Have a good W/E. Just lovely, Mary! It reminds me of ironwork, like a pretty antique gate. Doesn’t everyone embroider in 15 minute bouts? (Or is that just me?) I also find Hungarian embroidery to be (often) monotonous enough that 15 minutes here and there is exactly the way to get a piece finished. I know that’s how the old ladies in Hungarian villages do it… when there’s a break from housework, they stitch a bit. Creepeth ahead, Mary! It is looking great! I want to stitch the runner but I feel that the white ground fabric is not a good color for my home decor. Could I use natural color Strathaven linen or some other fabric. Not concerned about price. What colored linen compares to Alba Maxima? Fist of all, a scene of the Bayeux tapestry which is a long project. Then a small goldwork butterfy (my first one) to finish. Then go on my Beauvais stitch courses : that little stitch is a tricky one, slipping off the crochet hook faster than I can see it ! Then, I will have time to learn Crewel and Britton folk embroidery. The runner is beautiful. I can understand how you can get sick of it, but it is worth the effort. I have made a lot of progress in 2013 on a big sampler I began in 2012 . I will be able to bring it to the framer by June at the latest. I also prepped my other 2013 project and am ready to start. Hi Mary, just a quick question. What is the best material/fabric and thread to use for a project that will mostly comprise of Hungarian Braid Stitch? 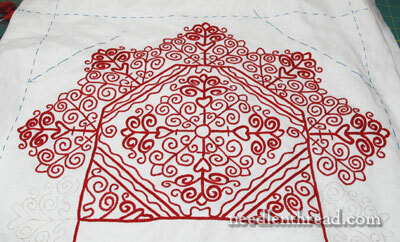 I’m feeling ambitious and will try to make something similar to your Hungarian Redwork Runner project. Not as big though, maybe something more like a placemat. Thanks!